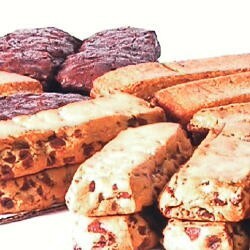 A steady flow of our famous cookies shipped 5 times a year on the dates you choose. Choose the date and flavors for each arrival of a 18 piece cookie pack(approx. 1.5 lb.). Especially created for our cookie bar fans all over the USA this economical option is also a super gift that keeps surprising the recipient. What are cookie bars? They are approximately 4 oz. each and in a bar shape approximately 5 1/2"X1 3/4". 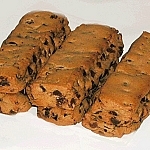 They are easy to hold and eat, keep well, freeze great and reheat to luciousness!